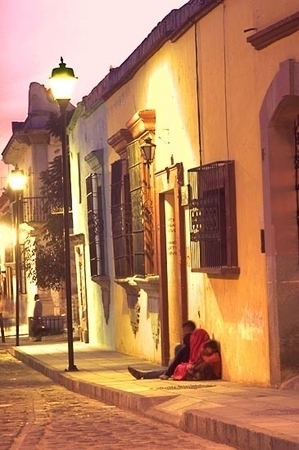 It was dusk on Avenida Macedonio Alcala, a pedestrians-only street in the colonial city of Oaxaca when I took this photograph. "Esperando" in Spanish means both "waiting" and "hoping" which describes some of the feelings in this photograph. The warmth of the glow of the street invites the viewer to become aware of the deeper level of complexities living in the photograph. For me it is a photograph of contrasts - of night and day, of family and solitude, of wealth and limited financial means. The dusk awaits darkness, the street awaits the dawn. The family may be hoping for more financial means represented by the man with the briefcase waiting on the corner. The waiting man may be hoping to have more time to spend with his family which the street family does much of the day. The photograph is about an embracing of dreams without judgment. For me, it is an important piece in my body of work and an important reminder of a perspective to keep in consciousness. "Magical Realism" is often the words used to describe the unique quality in Mexican and South American arts and letters whereby different levels of experience coexist simultaneously in the same plane - for example the spirit world and temporal world. I hope that this photograph captures some of that magic for you.